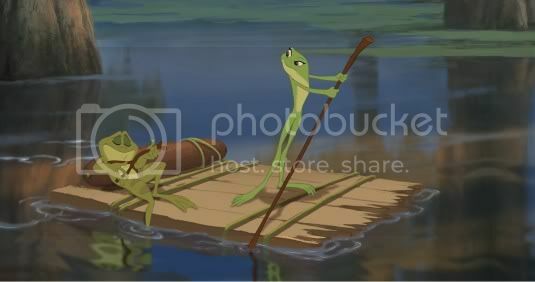 The Princess and the Frog is a throwback, in a great many ways, to the Disney films of old. The soft, hand-drawn animations and backgrounds look reassuringly familiar and markedly different from much of today’s CG animation (the exception would be Studio Ghibli’s continued output, like Ponyo [review here]). 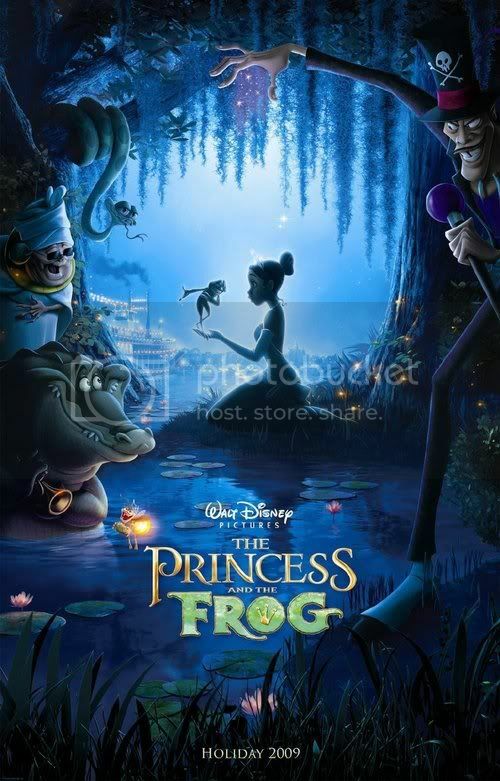 The Princess and the Frog is done by Ron Clements and John Musker, the same pair of directors responsible for The Little Mermaid, Aladdin [review here], and The Great Mouse Detective [review here], and the result is a perfectly satisfactory Disney film. 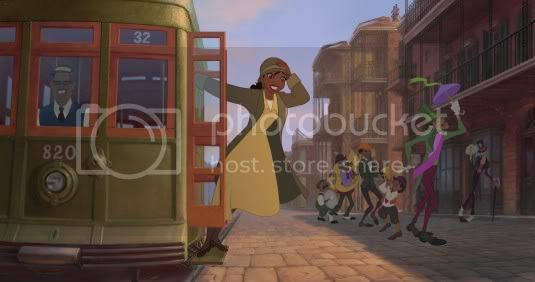 Much attention has been given to the race issue regarding The Princess and the Frog. And while the film does break new ground for Disney by having a black Princess, there’s more going on than just race. In fact, the movie itself isn’t concerned with race much at all. The heroine, Tiana (Anika Noni Rose), is the young daughter of a seamstress in the opening scene. Her mother sews dresses for the daughter of a wealthy businessman named “Big Daddy” La Bouff (John Goodman). His daughter is named Charlotte (Jennifer Cody) and is Tiana’s best friend. Once they’re all grown up, Tiana turns out to be a hard worker while Charlotte is a spoiled not-quite-official princess. Tiana’s dream is to open a restaurant of her own to make her daddy proud. He was a fantastic cook and longed for his own restaurant, but died before he could make it a reality. Tiana, a great cook in her own right, carries on the dream. To do this she works two jobs and never has time for friends or dancing. She’s still friends with Charlotte, to be sure, but their lives are rather different. Things change when there is an announcement that Prince Naveen (Bruno Campos) will be visiting New Orleans. He’s a happy-go-luck free spirit, but with a dark secret: he’s been cut off from the family money. His only goal in visiting America is to marry a rich girl, make her a princess, and have all the money he could need. But on his first day in town he meets the nefarious Dr. Facilier (Keith David, also creepy in Requiem for a Dream). Dr. Facilier is a voodoo master who can command his friends on the other side. Together they can make Prince Naveen’s dreams come true, for a price. As evidenced by the title, Prince Naveen turns into a frog, and then Tiana gets turned into a frog. As they rush to the necessary place to unwind the spell by the necessary time, through the swamps and bayous of Louisiana, they meet an odd variety of characters. Ray (Jim Cummings) is a charming and eccentric firefly who is in love with the moon. 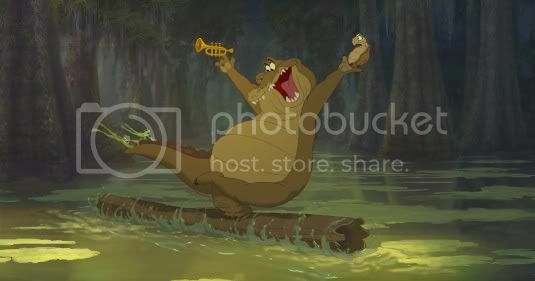 Lawrence (Peter Bartlett) is a trumpet-playing crocodile whose one wish is to play with a jazz band, something his size and terrifying demeanor make difficult. The unlikely quartet stumble through the jungle and engage in a variety of high-jinks along the way. As is normal with animated Disney features, The Princess and the Frog contains a fair number of musical sequences. The songs borrow from jazz and funk, lending a different air to the music than in previous Disney endeavors. Most of them are quite good and enjoyable, but none is particularly memorable. The movie’s charms lie primarily with the animation and drawings, and a strong central character. Tiana is a great role model, dedicated to her dreams and willing to work exceedingly hard to achieve them. She knows that nothing comes without effort, and proceeds in such a manner even when the possibility of love comes her way. Even the eventual happy ending does not diminish her career goals. Some of the supporting characters are quite delightful, particularly the winsome Ray with his few straggly hairs on his chin (I’m not entirely sure he’s anatomically correct for a firefly). The alligator is generally fine, and Mama Odie (Jenifer Lewis) is enjoyable as a crazy witch doctor the group encounters in bayou. And Charlotte, dressed as a wannabe princess much of the film, is likely one of Disney’s most bouncingly buxom side characters. Be warned, though, as there is a very sad moment involving one of the characters late in the film. Be warned, too, of the villain. Dr. Facilier is one of the most evil Disney villains yet. His direct links to the spirit world might be rather frightening for small children. Even some of his methods are a bit more grotesque than many Disney films, and involve using a character’s blood for one of his rituals (it’s not really as shocking as it sounds). 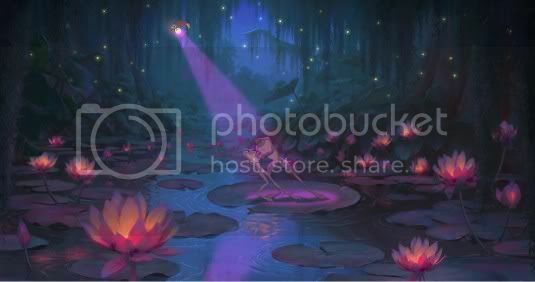 The Princess and the Frog has all the necessary elements one might expect in a fairy tale story told by Disney. It never really transcends the sum of its parts like better films such as Beauty and the Beast [review here] and The Lion King [review here], but it is still an enjoyable film. A new setting, new and different characters, and a different style of song will appeal to many audiences, and while the film is good it is not particularly memorable. This entry was posted in 2.5 pirate flags, 3 stars, Movie Reviews, P, Pirate Flag Rating, Star Rating on June 14, 2010 by Tim Irwin.